You know those people who insist on baking everything from scratch? They're all, "I don't need no stinkin' cake mix!" Well, Eric Muss-Barnes is one of those people--only with e-books. He taught me how to properly format a while back and recently did a blog post on the subject. The information is so valuable that I had to share it with you. :) Take it away, Eric! 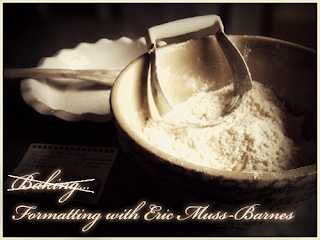 A big thank you to Eric-Muss Barnes! Question of the Week: Have you ever formatted an e-book? Glad people who know how to do this are willing to share for the rest of us. Thanks for sharing it. Great stuff. Ebook formatting isn't fun, but it's not too bad. I did a lot of research by watching videos like that and reading about all the different ways writers have done it. Now, formatting for a print book is a whole different ballgame. Thanks for sharing this! Awesome tutorial!!! Thank you for sharing! I'm closer than ever to self-publishing, so seeing this tutorial made my day. Thank you, again. Ugh. Don't you hate those little kinks? I never bake from scratch! I'll have to go check this out! Thanks so much for doing this, Carrie! For those who want some credentials, I'll let you know that I've built websites for Walt Disney Studios for more than 6 years and eBook formatting is based upon website HTML code. So, rest assured that I know what I'm doing, folks. It's a little complicated and technical, if you're not familiar with that stuff. But if you can follow along, my guide allows you to construct very clean and efficient eBooks. Seriously, love Eric's method. I'm a big believer in the HTML path. So much more control over the end result. Thanks, Jay! :) I agree with you there. When I know I have dual formatting projects coming up, I block off a week. Thanks for passing this on, Carrie! All my vlogs thumbnails are marked with episode numbers so people will realize that these aren't one-off videos and there is other content on my channel. I already have more episodes than Firefly! It's so awesome how many others want to help us little ole writers. Very kewl. Thanks. Yeah, I refuse to allow automated software to "convert" things for me. As an experienced programmer, I've seen first hand that 9 times out of 10, those conversion programs produce code about as clean as a crackhoes naughty bits. You're welcome. If you ever decide to program your own, I hope you find my information useful. Why not just write your book in the final format? That's what I do for print. I never need to reformat because my books are composed in their final format including font choices, page margins, and everything. I always used DOC files, but I hear a lot about how I should be using HTML. Just looking at this made me even more afraid to tackle it. I used to write HTML all the time but never learned the newer languages. But I will try this one and see if I can do it. If you already know basic HTML, you will be able to handle this, no problem. My tutorial files already packaged up all the complicated stuff for you. All you are really doing is going in and changing content. You won't need to know other languages either. Even the CSS is already done. It really is! :) Thanks, Joylene! Thanks for this information. I have to digest it first though. I learned to format using the Smashwords guide. Thought I'd tear my hair out on the first attempt, but it got easier as I went along. Now, I enjoy doing it because of the extra touches I can add. Thanks again. For now I'll pay. I have enough on my plate without formatting the book for publishing too. I am all over this! THANK YOU! I'm the same way with information, J.L. :) I'm glad to hear it's gotten easier for you! Carrie was frustrated too. But as I kept explaining to her, once you complete your own formatting once, you will have a template to do your subsequent books. I was helping her every single day when she was formatting "Strength" but she managed to format "Courage" all on her own. Nothing wrong with delegating some work. I prefer to do everything myself. But if I ever needed to create something beyond my ability (like a Drew Struzan style cover) I'd hire someone too. ^ #1 comment I've seen all day! Also: I do all my baking from scratch. All of it. seriously crazy how you can learn to do things with a click of the mouse and watching it on a feed!! i'm going to save this post and show my kids when they are older is this is how we learned to do stuff when we didn't know how...wonder what they'll say. geez mom...just ask the stan the holographic buddy.